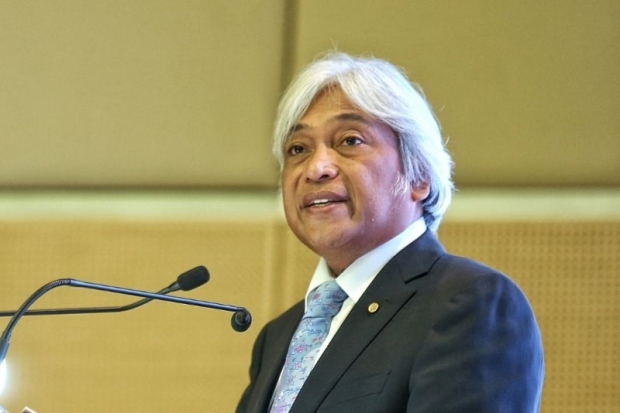 KUALA LUMPUR, July 18 — Malaysia has the capacity to absorb any exogenous shocks should the global economy deteriorates, with excess capital in the banking industry of about RM120 billion, says Bank Negara Malaysia Governor, Datuk Muhammad Ibrahim. He said Malaysia had since the 1997/1998 Asian financial crisis, undertaken a lot of reforms which did well in strengthening the banking sector with far-reaching impact. “Some of those reforms were very much fundamental. For instance, consolidating the banking sector from over 60 institutions to 10 and now eight banking groups, and these are far-reaching measures that we have done,” he told Bernama in his first exclusive media interview since his appointment as the central bank’s governor on May 1, 2016. He was responding to a question of the need to revert to unorthodox measures introduced during the Asian financial crisis such as the ringgit peg and other capital controls, should the global economic outlook deteriorates due to impact from major economies and the UK’s withrawal from the European Union following the ‘Britain exit’ referendum. Muhammad said that the consolidation of banks to eight banking groups was the right move as this has strengthened the banking sector in enabling the domestic banking institutions to stand on their own feet and compete with foreign banks as well as expanding their operations abroad. “The biggest test is that they [the banks] can expand their operations outside Malaysia and they thrive in the new economies they are operating in. “This shows they are competitive now and that is a big development for the domestic banking industry”, he added. He emphasised that other measures undertaken also involved the development of new entities such as deposit insurance corporation, or Perbadanan Insurans Deposit Malaysia, which has strengthened the banking sector in ensuring depositors’ money were fully insured. Meantime, the measures introduced in the banking sector, such as a more effective risk management practice and a stronger corporate governance culture, have been an anchor for the nation’s financial and economic fundamentals. “We want Malaysians to be confident of the banking sector, of the integrity and sanctity of the financial system and for it to be the epitome of good corporate governance. “Recently, we issued a new consultative document on Corporate Governance Guidelines for Financial Institutions which comprise several enhancements, much higher than what other entities are subjected to,” he added. The aim of the guidelines, he said, was to set a gold standard for governance in Malaysia where bankers should be looked up to for their integrity and stature. “We need to continuously sell our strong fundamentals and do more roadshows. We need to highlight the various bold measures we have undertaken over the last two decades and tell our story,” he said. He said confidence among foreign investors was building up, as evidenced by the large capital inflows into the bond market. On the worrying trend of household debt in Malaysia, he said, this was one area that the central bank has been monitoring very closely for some time. “The risks of destabilising financial imbalances have receded,” he added. He explained that the various macro prudential measures put in place by the central bank and strengthened supervisory oversight, have resulted in more prudent lending standards. “The banks’ affordability assessment, or debt service ratio, has improved drastically, now averaging at 40 per cent compared to 60-70 per cent before for the more vulnerable borrowers,” he said. As the Malaysian economy still depends on domestic demand, Muhammad said, there was no intention by the central bank to dampen private consumption. “What we do not want is that people who can borrow money, cannot have access to credit. PETALING JAYA: Most residential areas in the Klang Valley are filled with posters and advertisements of loan sharks, urging people to take loans from them. According to a survey by FMT, Damansara, Sungai Penchala and Taman Tun Dr Ismail had plenty of these posters and advertisements. In Damansara and Sungai Penchala, hundreds of posters were seen nailed onto trees at residential areas or high-traffic areas. 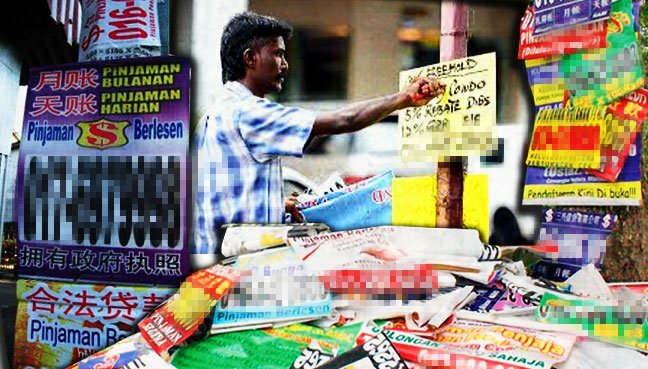 In TTDI, these advertisements were attached to electricity poles, bus stops and even garbage bins. A resident, Abdul Hadi Awang, 30, said these posters and advertisements placed around his housing area seemed aimed at Malays and had led a lot of them to borrow from loan sharks. “This could probably be one of the reasons the Malays are dealing with loan sharks almost all the time. “The ads and posters are placed at strategic places to catch the attention of a lot of people,” said Hadi, who lives in Damansara. Zainuddin Mohd Radi, 26, shared the same opinion. He said the increase in the number of posters and advertisements in the Klang Valley could influence Malays to deal with loan sharks whenever they had financial difficulties. Malaysian Muslim Consumers Association (PPIM) Chief Activist Nadzim Johan said the association had helped solve 10,000 cases involving loan sharks. “Out of that, 70 per cent of them were Malays, 15 per cent Chinese and 15 per cent Indians. The Malays usually take money in smaller quantities, perhaps several thousand ringgit. Credit Counselling and Debt Management Agency (AKPK) Head of Corporate Communications Mohamad Khalil Jamaldin said it provided financial management services, counselling and restructuring of sales for those facing credit problems. “If there is good financial management, they can have more savings,” said Khalil.